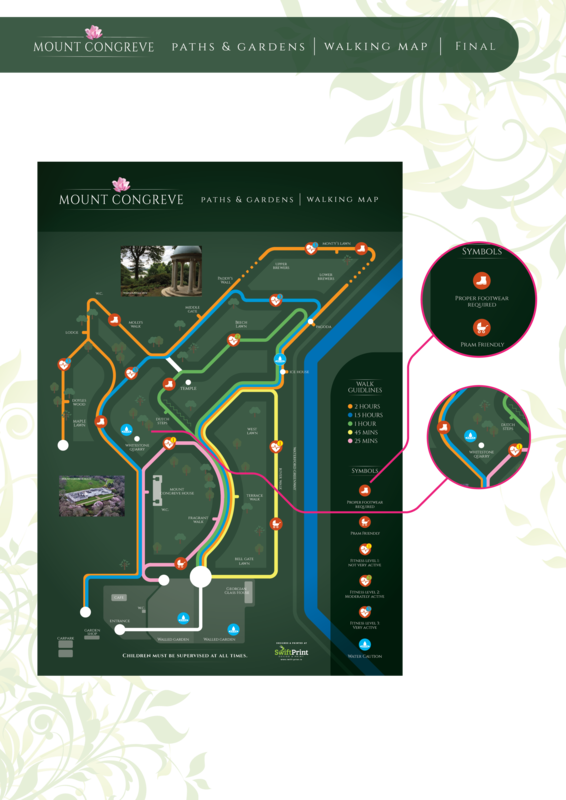 Mount Congreve, famous for being the home of one of “the great gardens of the World” approached Swift Print to design a map for their gardens and walkways. The gardens of Mount Congreve consist of around seventy acres of intensively planted woodland garden and a four-acre walled garden. During our meeting with Caroline and Ray, they discussed with us that the current map of the gardens is too confusing. What was needed was something clear, concise and visually pleasing to the eye, but most importantly something that would ensure visitors take in all of what Mount Congreve has to offer in the most convenient way possible. This was our task. Our research began with looking at previous brochures that included maps such as Castlecomer Discovery Park, Waterford & Suir Valley Railway and Thornton Hall Country Park (below – right & bottom). 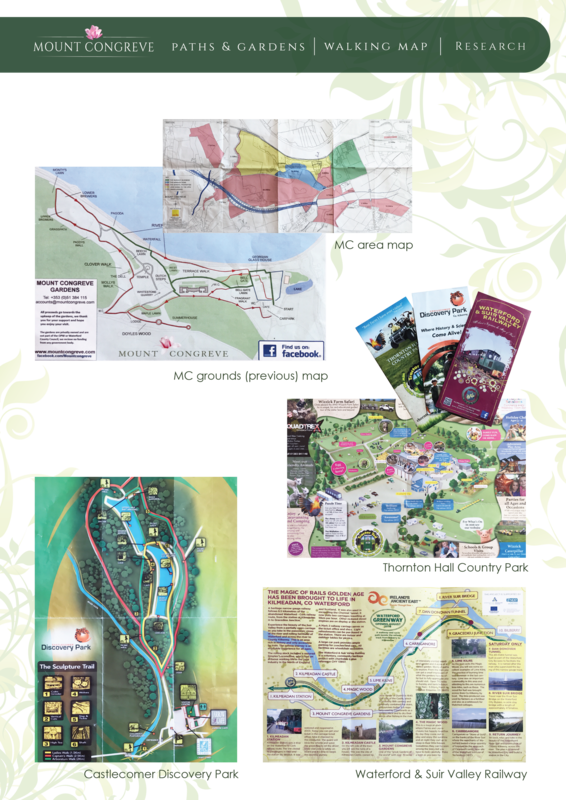 While each of these contained elements of what was required, ultimately Mount Congreve wanted to go for a more straight forward map with a flatter appearance that was easy to follow and contained the important necessary information only. Below (top) is an example of an actual map of the Mount Congreve area and also an example of the previous map used for the grounds. While the map is detailed it was not very user friendly. The Mount Congreve Gardens contain different walkways and paths, neither of these maps clearly reflect this. This was to become the main focal point of the map. 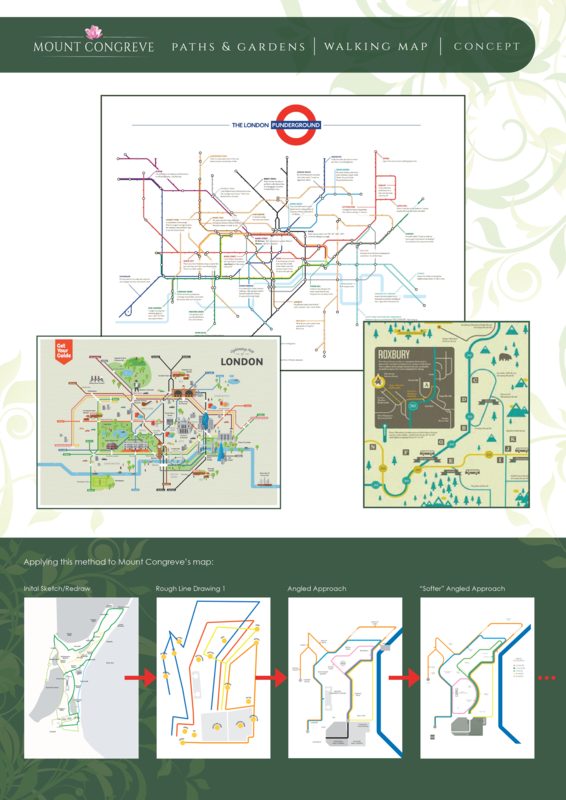 With the desired outcome clear, we began to research the London Underground maps and how they use geometric lines and shapes (not to scale) for clear and easy to follow directions. The next step was to apply this method to the Mount Congreve map. Each path marked out on the map is colour coded. There are 5 different colours which represent the different lengths of time it will take to complete; the time corresponding to the colour is clearly marked to the right of the map. Below the times, symbols indicate the different fitness levels and other important information that may be required before walking the paths.